Investigators want to hear from anyone who witnessed a man who is alleged to have intentionally driven into pedestrians, killing ten and leaving 15 others in hospital. “We’re still looking for more witnesses,” said Chief Mark Saunders, encouraging anyone with information to call the investigation hotline 416-808-8750. Chief Mark Saunders said any glimpse into the incident will help police in their investigation. “You may have a piece of the puzzle,” he said. A 9-1-1 call came into police at 1:26 p.m. on April 23 for a personal injury collision near Yonge St. and Finch Ave. It was reported later that the southbound rental cargo van had mounted the curb along Yonge St. and struck pedestrians. The driver was stopped and arrested at 1:52 p.m.
Alek Minassian, 25, of Richomond Hill was taken into police custody. “The actions definitely look deliberate,” said Chief Saunders. Chief Saunders said the investigation is in its infancy and nothing has been ruled out. Chief Saunders was joined by Mayor John Tory, Premier Kathleen Wynne and Minister of Public Safety Ralph Goodale at the news conference. Additional officers have been deployed across the city, with officers staying late and others coming in to work early to ensure the city is protected and that high priority calls get a police response. Police continue to make threat assessments to make sure the public is safe. Chief Saunders said his thoughts are also with the families and friends of those killed and injured, noting no police response can diminish the tragedy. Victims are still being identified. However, anyone missing a friend or family member can call Toronto Police at 416-808-8085. Police are also asking the public to please refrain from calling 9-1-1 unless they are in a life-or-death emergency. Anyone who witnessed the event and is in need of support, can reach out to Victim Services Toronto at 416-808-7066. 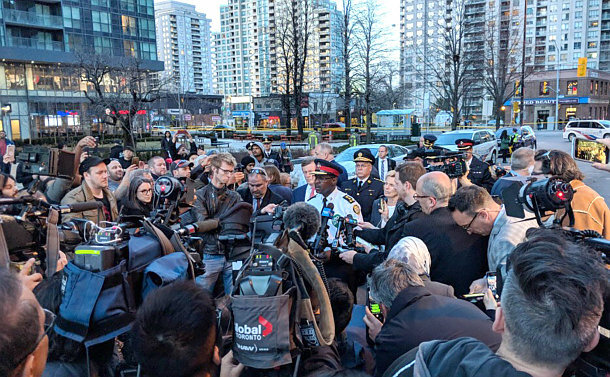 Chief Saunders commended the work of the first-responders, including police officers, paramedics and firefighters who rushed to the call for help. He commended the officer who made the arrest of the suspect. “It’s directly related to the high calibre of training that takes place,” he said, of the fact the arresting officer used as little force as possible.